Lazy Sunday afternoons Listening to Classical music. 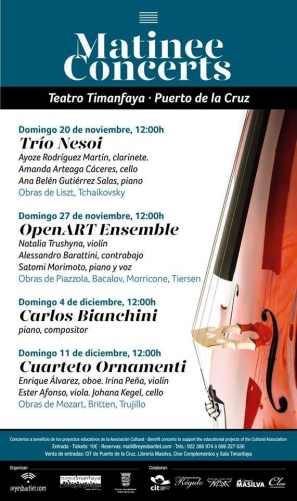 If you love a bit of classical music then be sure not to miss the Matinee Concerts in Puerto de la Cruz on Sundays at 12am, which this week will feature the Cuarteto Ornamenti in the Timanfaya theatre. Tickets cost 10 Euros each and the proceeds go to helping finance the educational and artistic projects of the Reyes Bartlet Cultural Organisation.